You are currently browsing the category archive for the ‘to do’ category. VelocityDC premieres this weekend– our very own Fall for Dance! If you’ve always wanted to try a dance performance, but not sure what to see and on a budget, your time has come with VelocityDC. On Friday and Saturday, October 2 and 3, for only $15, come sample six of the best dance companies from DC (and beyond) at the beautiful Sidney Harman Hall at 610 F Street NW, beginning at 7:30pm. Featured are short pieces from Ron K. Brown and Evidence, The Washington Ballet, CityDance Ensemble, EDGEWORKS Dance Theater, Gesel Mason, Nejla Yatkin, Edwin Aparicio, Liz Lerman Dance Exchange and Austrian choreographer Willi Dorner presenting the outdoor piece “Bodies in Urban Spaces”. You’ll see modern, African, ballet, hip hop and many forms in between. VelocityDC is designed for folks who may be new to dance, beginning with Gesel Mason’s performance of “How to Watch a Modern Dance”. Stay afterward at the bar to swap impressions, meet some dancers, and finally be able to ask them, up close and in person, how they do it all! Night owls, stick around for VelocityDCLate Night! At 10pm on Saturday, October 3, a cabaret-style showcase of movement, music and mayhem featuring dancers, poets and musicians. This late-night, 18+ cabaret promises an evening of music, movement and mayhem including appearances by Andile Ndlovu, Capital Movement Project, Contradiction Dance, Furia Flamenca, Gesel Mason, Gilded Lily Burlesque, Kentavius Jones, Komplex, Lucy Bowen McCauley Dance, Regie Cabico/Sol y Soul, and Urban Artistry. In addition, relax and enjoy the Harman Center bars and lounges with DJ Ian Knight (Philadelphia) into the early morning hours. Street performances of Willi Dorner’s “Bodies in Urban Spaces” will take place both evenings free to the public. “Bodies” begins at5:30pm each night, beginning at the Archives/Navy Memorial Metro and winding its way throughout the Penn Quarter neighborhood. Presented in partnership by Washington Performing Arts Society, The Shakespeare Theatre Company, Dance/MetroDC with major artistic partners The Washington Ballet and CityDance Ensemble. Visit www.velocityDC.org for more information. Tickets are on sale now for $15 at the website or the Sidney Harman Hall box office, (202) 547- 1122 or toll-free (877) 487-8849. It was a sticky, humid day at the 2009 Smithsonian Folklife Festival, but this did not stop Puerto Rican bomba y plena musicians Viento de Agua from giving a dynamic performance that had the audience on its feet dancing. Here is a video I made of Viento de Agua performing a plena. I did not catch the name of the song, so if anyone knows what it is, please comment. Plena is a traditional Puerto Rican style of music that we were told has its roots in the sound of a train. You can certainly here this underlying “chugging” sound in the music. Plena is one of the many caribbean styles that lends its rhythms and styles to salsa and merengue. It is characterized by the use of percussion instruments and vocal harmonies to form the rhythm and tune. This and much much more can be found on the Wolf Trap Site. The recession is not excuse– the lawn seats are the cheaper– and more relaxing– way to go. So grap a picnic basket, a blanket, and enjoy some arts under the stars this summer! The US Mint will be releasing a new set of quarters that will feature America’s national treasures. Did you know that Jacob’s Pillow in Massachusetts, an important venue for dance and the other performing arts in our nation, is a national historic landmark? Deval Patrick, the Governor of Massachusetts, is giving the public a chance to vote on which Massachusetts national treasure will be featured on the quarter. Vote for Jacob’s Pillow here. It is the third item under Berkshire County, the second bolded listing. Wouldn’t it be great to have one of the most important venues in America’s dance heritage immortalized on a quarter? You can submit your vote as many times as you wish, so vote often! I am not usually big on new year’s resolutions, but 2008 was kind of a long tough year so I’m welcoming the chance to turn over a new leaf. Instead of calling it my list of resolutions, I’m going to call it my 2009 Action Plan. Making vague promises to myself (i.e., gotta lose that weight and make it to the gym more) only sets me up for failure. 2008 was hard on many fronts. For one, it was a difficult year for the world. We had so many natural and human disasters. Senseless wars dragged on and death tolls continued to mount. Certain toxic elements in my workplace made it hard for me to be there many days. Then there was the presidential campaign, which lasted two years. I threw myself into a lot of projects and commitments in 2008. Three dance performance commitments– two of them incredibly time intensive, a whole lot of travel (mostly for work), and a full-time volunteer commitment on top of my more-than-full-time job for three months this fall. All of these thigns were worthwhile and important, but sometimes I sacrificed myself along the way. When you’re that busy and invested in something, you tend not to focus on your own needs very much. This year is already off to an auspicious start. The toxic element is out of the way at work and I feel a thousand times better. Our political climate is changing– we have a new President that for the first time in a decade I feel I can claim as ‘my’ president. I invested a lot of my own time and emotional energy in getting him elected and feel personally invested in his success. It is so nice to feel hope for my country’s future. And thank god the campaign is over; we also have a nice newly proportioned Congress to show for it. 2009 will be a year in which I nurture myself; and that in turn will make me a better friend and spouse. In 2009, I will limit my performance commitments to two. That’s one less than 2008, and it will give me some more space to pay attention to my own development. I will also have more flexibility with my time. In 2009, I will live a more spontaneously. When I am moved to buy a ticket or take a trip, I will, budget permitting. I have a lot of extra vacation to use this year, so time is not an issue. I will take a trip to NYC before the end of the Spring. I will make the time to spend more time with my husband and my friends. We will welcome more people into our home (mission accomplished– we had our first dinner party in at least a year or two on New Years Eve). To do this, I’ll have to learn to say no to some commitments that I might otherwise have taken on. Each time I am moved to say something negative, complaining, or nagging, I will count to three before I open my mouth. Oh, and one final boring one (because it’s something I’ve actually been able to stick to): I will floss every day. So that’s my list. No mention of diet and exercise, because if I really stay true to the above, the rest will follow. What about your 2009 Action Plan? What is a dance rockra, you ask? It is one part dance, one part opera, and all parts are totally rocked out. Here I am, in the swamps of Northern Virginia, wishing once again that I lived in Manhattan, our nation’s cultural capital. Luckily I have a consolation prize this year: I will be attending the inauguration without having to sublet out someone’s crappy studio apartment for two grand a night and could even bike down to the national mall if I wanted. Haha. I discovered the East Village Opera Company about two years ago courtesy of Pandora. Their winning combination of opera greatest hits and Queen-esque power rock ballads (rockra, if you will) had me at hello. Be sure to check out the song that first captivated me, Au fond du temple saint, the well-loved Pearl Fishers duet, re-arranged into a power rock duet between a man and a woman. Here they are with their version of the Queen King of the Night aria from The Magic Flute. When Joshua Buscher speaks of Arthur Laurents, which he does frequently during our brief interview, it is with the reverent tone of a student quoting the teachers of a master. Which is exactly what Laurents is. At 90, he is very much the hands-on director of the legendary icon of American theater– West Side Story— the show he wrote over 50 years ago. 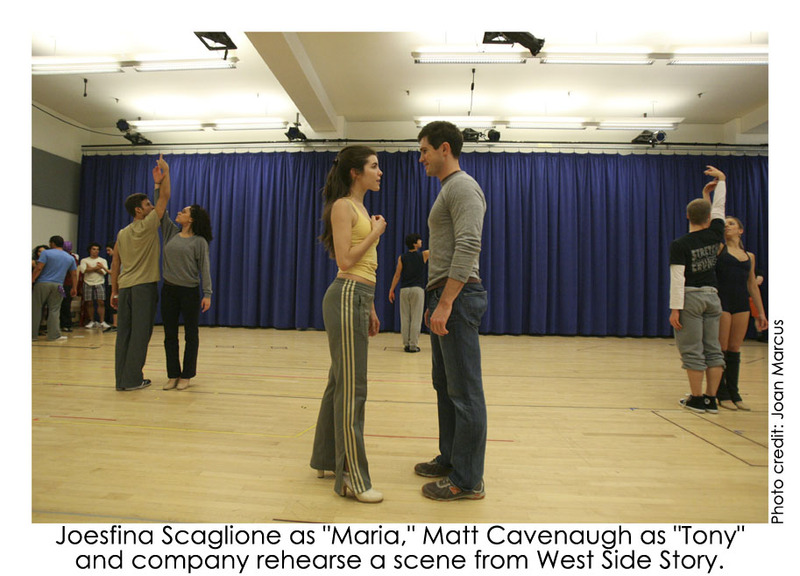 Since July, I have been trying to line up an interview with someone from the production of West Side Story’s revival. By now the play’s publicist and I have become virtual pen pals. After reading that the play would open for its pre-Broadway run right here in Washington D.C. (in the National Theater, the same venue it first opened at in 1957), I was determined to get the inside scoop on it. Through auditions, the New York rehearsals, and finally DC rehearsals, we continued our correspondence. Finally, just days before the opening of the first preview performance in mid-December, I am on the phone with cast member Buscher, who is enthusiastically describing his experience preparing for this historic revival. What makes this revival of West Side Story so unique is language. Laurents’ late partner, Tom Hatcher, had seen the play staged entirely in Spanish in Colombia and found that it totally changed the dynamics– the Sharks became the heroes and the Jets the villains. “I thought it would be terrific if we could equalize the two gangs somehow,” Laurents told the New York Times earlier this year, by having characters speaking amongst themselves in their native language. Adding the Spanish into the show 100 percent makes it work,” says Buscher, “It helps so much with the energy of the show– what it does is makes that barrier of the Americans versus the Puerto Ricans even wider. Some of our audience can’t speak Spanish, so they get frustrated,” adding to the tension the audience will feel between the Sharks and the Jets. In case you’re one of those non-Spanish-speaking audience memeers, don’t worry– there will be supertitles. Although some scenes, such as the one preceding America, are mostly in Spanish, he is confident that the acting and dancing will transcend language. One thing I was dying to know was if Robbins’ choreography would be altered at all for greater cultural authenticity. Would the Puerto Ricans be adding some bomba or plena sabor to the dance numbers? Then again, no reason mess with a good thing (no, make that an amazing thing — West Side Story is in my book, hands down, the best dance musical ever, and the best music musical, for that matter). So what if the choreography of America is more flamenco than salsa? Joey McKneely, the reproduction choreographer did change some of the blocking and spacing in the piece to underscore the culturally adversarial give and take between the homesick girls and the girls that are trying to become Americanized (which explains why Anita will at times break into English even with her compatriots). It will be more about that interaction than an “and now folks, here’s the big dance number” performance to the audience; but Robbins’ choreography will remain intact. This will be Buscher’s Broadway debut. He is Diesel, the “meathead” of the Jets– a surprise not only to me– going by his angelic headshot and cheery voice– but also to his family and friends. “It was kind of a process for me to get into that because I’m not really a meathead,” says Buscher. “But he’s come to life and it’s great. When we do the rumble scene it’s awesome. It’s very empowering for me to jump on stage and be able to protect the guys that are behind me.” Late bloomers, take heart. 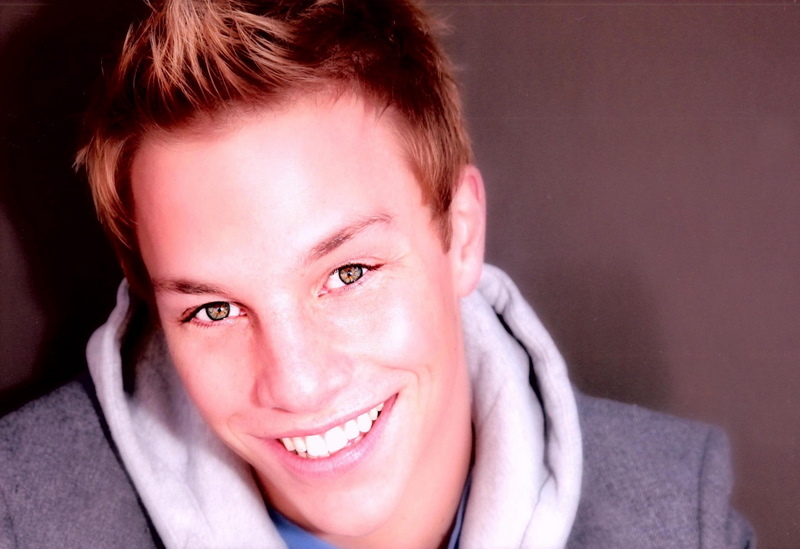 Although Buscher was a gymnast in his youth, he didn’t start dancing until he got to college, realizing it was important to his development as an actor. The audition process for West Side Story, which was six months long, really improved his technique. That plus an hour-long barre class before each day’s practice and the encouragement of McKneely and his assistant. “It helps that [Diesel] is a fighter because he’s not the most balletic boy; they did a nice job of casting if I do say so myself,” he says with a laugh. 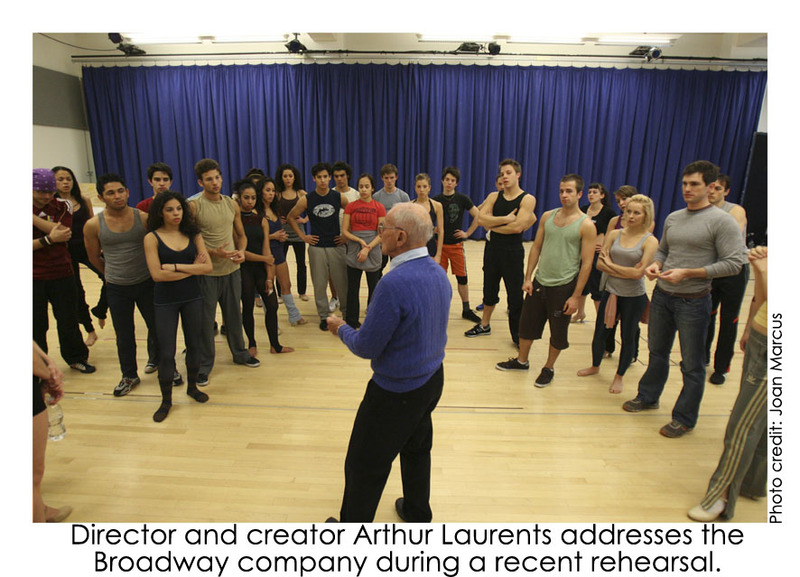 It is a young company, with many making their Broadway debut– with so much of the cast being made up of teenage gang members, that is a necessity. There are some seasoned veterans, of course, including Karen Olivo (Anita) who was most recently seen in In the Heights. 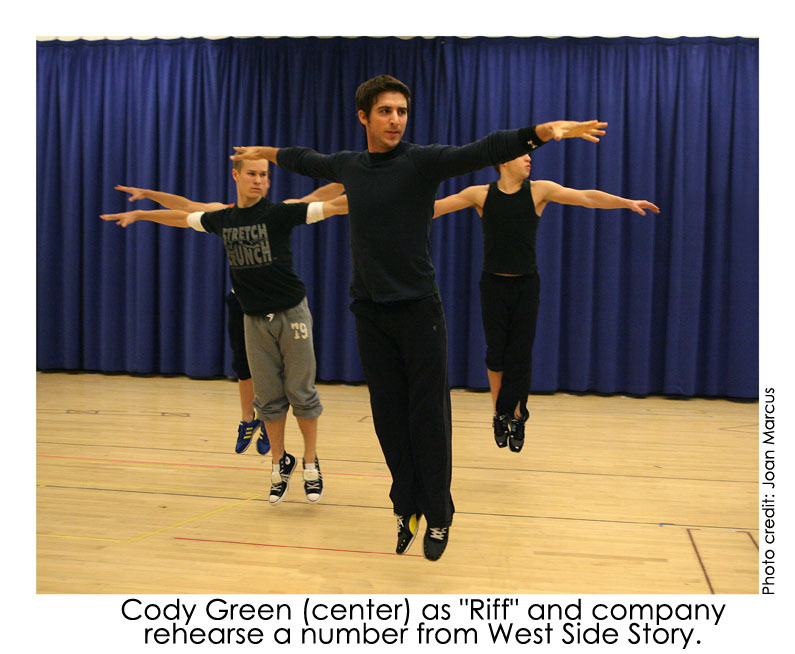 Here’s another familiar face: Step It Up and Dance fans will recognize Cody Green in the role of Riff. Six-month audition process aside, I want to know the nuts and bolts of getting a Broadway dance musical from studio to stage. “The first week of rehearsals was just dance, that’s all we did,” says Buscher. After a brief meeting with Laurents and the creative team, “literally an hour later we were on the floor learning Dance at the Gym.” Nary a libretto was cracked open for the first full week of practice as the dancers learned all the dance numbers. This allowed the choreography to become second nature so the dancers could focus on acting. Additionally, as lines, songs, acting and blocking were layered on, the choreography gained depth along with the process of character development. West Side Story runs through January 17, 2009 at the National Theatre in Washington, DC. Tickets are on sale through Telecharge (800) 447-7400, www.telecharge.com) or at the National Theatre Box Office (202-628-6161 www.nationaltheatre.org. It will open on Broadway on February 23. One source for listings of dance performances in the DC area. JUMP ON THE BANDWAGON IN THE SPIRIT OF CHOICE AND CHANGE! MEET other dance artists, designers and administrators! STATE needs! ASK questions! ELECT to make a difference in DANCE in the DC/VA/MD region! This gathering is non-partison with the exception that it is pro-art, pro-dance, pro-sustaining, pro-growth! Like all productive meetings, afterwards we will take the discussion to a local beverage establishment to discuss how art can change the world ! IF YOU MAKE DANCE HAPPEN—ANYWAY/SHAPE/FORM—ELECT TO BE HERE! October 27th, 2008 7:30-8:45 pm Maryland Youth Ballet, Silver Spring! Bodies of water—pools, lakes, the sea—aren’t just for swimming and splashing around. They are also great places to dance and improve your ability to move in different ways. The resistance provided by the water, the buoyancy of your body in the water, and the additional lift provided by the waves of the sea can all be used to your advantage. I’ve been doing my barre exercises in the pool this summer. Not only is it relaxing and enjoyable, it’s helped me improve muscular strength and extension. In the water, you have to move more slowly, and therefore articulate each movement more carefully. The resistance provided by the water, when done on a regular basis, helps to strengthen and tone your muscles in a different way than when on dry land. Your center is more important than even, because you must keep it even tighter to stay upright in the water. To do your barre sequence in the pool, stand in the shallow end with the edge at barre height, to rest your hand and proceed with your same sequence as usual. I’ve been told that extension is less a matter of flexibility than of strength and center. Being in the water really drove this point home for me. I am able to extend my leg a good foot higher in the water simply because the buoyancy of it did all the work for me, floating my leg up much higher than I am normally able to keep it on my own strength. Another area I’ve been able to work on is jumps and leaps, a big area of weakness for me. The gravity-defying properties of water are a big assist and have helped me to improve my technique and build confidence. With gravity, it’s basically impossible to “articulate” a leap, so if this is an area of weakness for you, the slowness and lift of water can help you get down to the mechanics of getting off the ground. Even more fun than a swimming pool is at the beach. Timing your jumps or leaps with the waves will carry you higher and farther. Sometimes when you’re on vacation, you don’t have the chance to go to class, but with a little resourcefulness (and water), you can keep on dancing. As the summer comes to a close, here’s one more reason (as if you needed one) to head to the pool or the beach while you still can. Something old, something new: West Side Story and Bill T Jones’ Fela! Mr. Laurents, who turned 91 on Monday, traced the origin of the new revival to his companion of 52 years, Tom Hatcher, who died in 2006. Mr. Hatcher was a fluent Spanish speaker, and on a visit to Bogotá, Colombia, saw a staging of “West Side Story” in Spanish. In that version, Mr. Hatcher reported back to Mr. Laurents, the language had transformed the show: the Sharks were the heroes and the Jets were the villains. Also of note, Bill T. Jones is bringing the music and life of Fela Kuti (the Nigerian musical superstar and political leader) to the stage in the off Broadway production of Fela! The New Musical. There are plenty more videos at http://www.felaoffbraodway.com/. I enjoyed watching all the different rehearsal videos, particularly having been so recently involved in the production of a musical myself. Hopefully I will get a chance during my busy summer or fall to make it up to NYC to check this one out. Fela Kuti seems like a very interesting subject for a musical, allowing the socio-political content to be framed by the music that reflected it. Yesterday and today, a summit has been convened at Wolf Trap to discuss the integration of environmentally friendly practices into the arts. This seems like such a natural conversation to have that I’m surprised it hasn’t already occurred. Artists tend to be politically aware, and I’m sure that many have adopted greed practices at a personal level. Still, if you go to a performing arts venue it’s clear how much waste can occur– from the paper the programs are printed on to the vast amounts of energy required to power up a performance or education facility. A webinar disussing the results of the summit is to occur at 4pm today. I’m told that the webinar, as well as the results of it after the event itself, can be accessed here (although I just went to the site and couldn’t locate a link for the webinar so I’ll take a look after the fact to see if they reported back anything). This seems like a good opportunity to start a conversation about environmental issues in the dance blogosphere. With awareness of the negative impacts on the environment finally reaching a tipping point thanks to Al Gore and gas prices, green practices are finally starting to seep into the mainstream. What are your concerns as an artist, student, or patron of the arts? What can individuals and organizations to to lessen their impact on the environment? What are you or your organization doing? My favorite DC event starts today. The 2008 Smithsonian Folklife Festival starts today and ends July 6 on the National Mall. Each year, the festival showcases three cultures and the individuals that keep their folkways alive. Traditional crafts, foodways, social and economic traditions, music, and of course, dance are demonstrated by those that practice them on a daily basis. This year’s themes are Bhutan, NASA (how is that a culture?….I guess I’ll find out), and Texas. I’ll be particularly interested in learnining about traditional Bhutanese dance, and checking out the Tejano music and dance. The close proximity of my office to the festival all gives me the opportunity to try out the food on my lunch break. The festival’s schedule is available here. If you are in DC or within driving distance, this is worth the trip! A number of videos are available here if you can’t make it down or want to preview the festival and each theme. The Dance Critics Association Conference starts this evening and goes through Sunday. Due to my grueling rehearsal schedule I will not be able to attend it in full as I had hoped, but am planning to catch one or two sessions each on Saturday and Sunday. Regrettably one of the ones I will miss is the panel on Dance and New Media, featuring among others Doug Fox of Great Dance. I also highly regret missing Alastair Macauley’s keynote address. Coinciding with DCA is the Ballet Across America festival at the Kennedy Center. If you are in DC, you should definitely go to this. It’s a rare opportunity to see some of America’s best ballet companies all in one place. We have tickets to the Saturday night performance featuring the Pacific Northwest Ballet (Jardi Dandicat by Nacho Duato), the Kansas City Ballet (The Still Point by Todd Bolender), and our home team, the Washington Ballet (Tharp’s Sinatra Songs). Other companies being featured this weekend are Ballet West, Pennsylvania Ballet, Houston Ballet, The Joffrey Ballet, and Oregon Ballet Theatre. Suzanne Farrell’s Notes from the Ballet give more insight on some of the works being presented. You can get tickets here, and if you use promotion code 30503, you’ll get a nice $15 discount on most seats. Only three more days to submit a nomination for the Metro DC Dance Awards. The deadline is May 31.